Culture, language, conversation make humans deeply social. At the core of our social nature is an embodied sense of moral accounting. We hear from every child (from the moment they can express it in words) a ‘claim’ of ‘that’s not fair’. Our sense of moral, emotional, social accounting is biologically embodied. One could argue that when primates groom each other they are paying debt or establishing credit enacting a homeostasis within a dynamic social fabric. How humans account and take into account the discernment of values and value - are all forms of technology. These technologies can include culture and language. What they do is extend memory beyond individual recall, and enable an external recording of accounts that can be publicly verified. As McLuhan and other have noted human shape technologies and technologies shape humans - technology is the most human thing about us. The human-technology dyad is complex, entangled and evolving. It both shapes the boundary conditions that in turn shape the attractors of our ideas, our memes and experiences of moral fabric which in turn change the boundary conditions nudging the human environment toward new attractors. This short paper will set the stage for a longer paper that will explore the confluence of Values and Value in the emerging digital environment. In turn, the digital environment is enabling unprecedented capacities to account for value, value creation in all domains of social and individual life and accredit the enactment of our values. The idea that science provides Value-Free – Objective, Self-Evident-Fact which equals TRUTH (in itself - or is the foundation of TRUTH) has always been scientifically inadequate. This inadequacy acted as Science’s Shadow (in a Jungian sense) as it fought the culture wars against the corporate organizations of Religion (defined as arbitrary Dogmas of beliefs and faith). Religious dogma and Science dogma are competing forms of certainty. Both types of dogma are inherently self-referential. We trust science because it can establish verifiable facts – which in turn are trustworthy because science establishes the facts by framing them within a theory. We trust religions because they establish beliefs which in turn are established by how religions can frame them within a dogma. Turing’s stopping/halting problem – adding to Godel’s incompleteness. Complexity sciences – and the unpredictability of emergent phenomena – non-reducibility of wholes and inability to model some phenomena (e.g. some complex systems can’t be reduced). …it seems likely that the answer lies beyond biology. Karthik Raman, a former postdoc in Wagner’s lab, now at the Indian Institute of Technology Madras, has studied much the same issues of functional equivalence of different circuits not for genes but for electronic components that carry out binary logic functions. By randomly rewiring circuits of 16 components and figuring out which of them will perform particular logic operations, Raman found that they too have this evolvable topology. But crucially, this property appeared only if the circuits were complex enough—if they had too few components, small changes destroyed their function. “The more complex they are, the more rewiring they tolerate,” says Wagner. Not only does this open up possibilities for electronic circuit design using Darwinian principles, but it suggests that evolvability, and the corollary of creativity or innovability, is a fundamental feature of complex networks like those found in biology. And that’s the rub - there is no clear, pure, uncontaminated, unmitigated TRUTH about Values. However, the legitimacy of any ‘truth’ arises from trusted social institutions – which are how human enact forms of conversation. For example, the conversations represented by the institution of science are shaped by rules and processes (ever evolving in rigor) that enable participant to come to agreement on evidence/facts that support theories. It is the quality of transparent institutional conversations that is the source of legitimacy – not the appeal to ‘authority’ but to evidence-supported-by reasoning (theory) tested through methods and technologies of rigorous ongoing conversations. A complex society has many institutions. A very useful definition of an institution (to distinguish it from an organization) is provided by Douglass North (a Nobel Laureate in economics) which I paraphrase as: ‘Institutions are the rules of the game and organizations are the players in the game’. For example, the institution of marriage could be understood as the rules of publicly committed relationships, while the players in the institution would include: religious organizations, civil organizations, private sector enterprises involved in the ‘marriage business’, narratives of romantic love, individuals wanting a committed relationship, etc. I would add a nuance to North’s definition of institutions. Rather than seeing them as ‘rules of the game’ I think they are better conceived as ‘rules of the conversation’. Rules that enable honest conversations and keep conversants honest. In his 10 January farewell speech, President Obama made the point that democracy is most fundamentally a system for conversations – about ideas, values, means and ends. Conversations that we engage with in order to achieve a more ‘perfect union’. It is only through engaged and honest conversations can a democratic society and culture, establish any form of shared reality. An open and democratic society that enables the production of a shared reality enables people to align values. To do this requires many types of transparent institutions – structured to steward generative conversations, including institutions of science, law, politics, religion-spirit, health, political-economics, civil engagement and many more. Without legitimate institutions of conversation, we have no hope of generating the requisite trust for sustaining social and human progress. It seems that most of the current preoccupation with the state of our institutions if almost entirely focused on the political institutions of conversation. However, the decades of assault on government – haven’t only been about anti-science but also about anti-religion, and most importantly - about anti-institutions. What seems to be left out of the current debate about ‘fake news’ and the ‘post-truth’ era – is the many decades of corrosive, coercive and ubiquitous influence of advertising and marketing in shaping media institutions and content. It is a truism that mainstream media delivers viewers as their real product to their real clients – the marketers. Main stream media has been – of-for-by Big Business. There is a significant body of thought that is concerned with the transformation of the citizen into the rational consumer - end-user. This is deeply worrisome. A shift from citizen as equal participant to consumer-end-user is a shift in the rules of power in the conversation. Marketing has imbued our times and experience. There is no aspect of modern life that hasn’t been ‘infected’ with both the behavioral sciences and theologies of marketing. Key to the institutions of marketing and the manufacturing of consent is a host of methods, including cherry picking data and sources, or selective or out of context quotes or comments, presenting false-equivalent views, omitting genuinely alternative possibilities, conflating correlation with causation, setting up straw men to attack, insinuating claims and the very careful selection of metaphors and frames to shape how audience engage in the entailing reasoning. However, science also has played a deeply important role in conditioning collective sensitivity away from the certainties of Dogmas (whether scientific or religious) toward an apprehension of uncertainty. Science has introduced the humanity to an inevitable uncertainty that imbues our realities. This will be covered later in the paper. The elemental context of exploration in this paper is summarized in two ‘sound bites’ below. I ask the reader to suspend disbelief in order to follow trails of reasoning shaping a exploration about value and values entailed by these paradoxical probes. Often we begin a conversation about Values with a focus on abstract concepts - things like justice, fairness, equity, equality, freedom or more recently the environment, ecology, sustainability, etc. Companies, corporations, organizations of all sorts and even nations try to define their culture in terms of some list of Values. We seek to define a set of Values that can produce the ‘good life’. Conversation about Values are complicated because we often assume that reasoning means relying on formal systems of logic - and thus that there is a single universal proper form of reasoning. Further, in any formal system of logic, a contradiction is considered evidence that there must be an error in one of the binary proposition. For example one can’t be both, free and enslaved, autonomous and dependent, fair and biased, etc. The frame of right vs wrong also nudges people to view Values as being a set of concrete, unitary, homogenous, pure concepts - each matched with a binary opposite. For example Love vs Hate, Equality vs Inequality, Diversity vs Homogeneity, etc.. The tendency to framing contradiction as a right vs wrong problem rather than as an encounter with paradox makes substantive conversation difficult. A frame of right vs wrong nudges people toward argument - rather than conversations regarding ‘honest accounts’ of perceptions and experience. The frame of ‘honest accounts’ will be elaborated below. In societies evolving toward liberal political economies, the question of Values is entangled with metrics of accounting. We accept as natural, efforts to measure Value Creation, exchange, storage, etc.. We also try to measure how effectively we implement our Values. Our language of accounting bridges the domains of Value (e.g. Values Creation) and the systems of our Values that are embodied in our institutions of conversation regarding justice, equity, loyalty, welfare, etc. Value creation evokes the experience of a concrete currency. However, currency is perhaps better imagined as a way to accounting for information flow - or perhaps more easily understood as information flow about value flow (creation, exchange, storage). This might seem logically confusing – conflating Values with accounting - but accounting is fundamental to social fabric. For example, primates when grooming are establishing credit or paying debt and even young children with cry out with claims of what is ‘fair’ (which may not be inter-subjectively valid). One could easily argue that grooming is a conversation accounts for the dynamics of the values of social fabric. Without some form of acknowledgement via a metric of accounting – there is no way to implement any system of Values. Accepting that language is a technology of memory, communication, reasoning and thinking – it is a technology that has become a natural human-built environment (as McLuhan noted language doesn’t live in human rather human exist in language) – one that evolves with uses and in return also evolves the users. As we language about and with Values – we can only enact them in our lives, behavior and social experience through a personal and interpersonal ‘accounting’ with which we guide our lives. How do we take account of our enacted values? We do this all the time - who hasn’t heard the phrase ‘I love you more than you love me’, or ‘You’re taking advantage of me’. These statements and so many others don’t explicitly state a precise metric - but they do assume a ‘social-moral’ bookkeeping in all of our relationships. Remember the proposition – Ethics is Dead – Long Live Social Fabric? When we embrace the implications of complexity and uncertainty – we immediately surrender our capacity to know in objective or absolute terms - ‘The Good’. We have no way to determine is a ‘good’ action taken now will really produce ‘good’ results in the next step or several step. In the same way we have no way to determine the corresponding implications for a ‘bad’ action – will it really result in ‘bad’ consequences? This determination of what is ultimately ‘good’ or ‘bad’ is the foundation of Ethics. Morality on the other hand is the relative assessment of action taken in terms of social judgment. For example in Adam Smith’s 'Theory of Moral Sentiment’ he elaborates that everyone in making a choice of behavior asks themselves ‘what will others think’. He makes the case that all of us – want to be ‘praiseworthy’ and ‘blameless’. It is in thinking about moral sentiments that Adam Smith used the term ‘the invisible hand’ for the first time – suggesting that when he used the same term in discussing market systems – the regulation of such as system also depended on social and ‘moral fabric’ (not just the price mechanism). Thus, he also suggests, that moral ‘values’ accounting is fundamentally implicated in social fabric. Since we’ve come to understand relativity (no objective frame of reference), quantum phenomena (observer changes what’s observed), chaos (sensitivity to initial conditions - hence unknowability of how small a difference will make a difference or how large a difference won’t make a difference at all), complexity (where new phenomena can unpredictably emerge beyond a mere addition of components) and more and Moore. What is in fact before us, as the reality of our survival, is the experience of eternal wayfinding. Wayfinding describes the process of making our way when there is no map. Navigation is only possible when we have a map and can plot a path from ‘A’ to ‘B’. For example – 99% of the time that a regular airplane is travelling to its destination, it is off-course. But because we have precise maps we continually determine precise destination - ‘the there’ and the precise locations ‘the here’. In this way, a continual course correction enables the plane to arrive precisely at the right place. But when the terrain is unknown, and even more – when it is always changing - then we are immersed in a situation of wayfinding - making paths as we explore. We live in a reality where each step we make – changes the conditions of the next step we ‘can’ take. A continually changing environment requires different types of choices. The capacity to establish a dynamic homeostasis of values in a robust and flourishing society-in-environment is vital. But enacting such is a complex endeavour where values exist within an ecology of tensions is very difficult and even more so within a ‘conversation of paradoxes’. It may seem strange to mix concepts of money-as-currents/currencies-of exchange-of-value with conversations-as-wayfinding-negotiations-of-Values. However, both are shaped by the attractors of value-creation. The problem is that money is a highly constrained flow of highly constrained measures of value. Whereas conversations of Values are widely open ‘ink-blots’ of projection - current-seas that we negotiate in our wayfinding, languaging and behavior. The challenge, arising from this structure of reasoning, points to the notion that a list of Values (as abstract concepts) is less useful than an engaged conversation of values as they must be negotiated and accounted for in our lives. This leads us to consider the idea of a conversation dedicated to Value Creation, exchange, storage, etc. must be developed - one that helps us address evolving networks of technology, education, culture , collective memory and Language. Another fundamental shift arising in the 20th century and at the core of the 21st - is the notion of truth. As noted at the beginning – the proposition for the 21st century could well be “Truth is dead - Long live Honesty”. What does this proposition mean? Science doesn’t ever ‘prove’ anything - what it does do, is provide an honest account of evidence to support an honest theory (one that tends to be accounted for as pragmatically useful). Science is much more about ‘know how’ than ‘know why’. Or, all models are wrong, but some are useful. This honest account is held accountable by the institutions of conversation that we call peer-review. A lawyer is not concerned with TRUTH of justice, but should be concerned with an honest account of the legal means to pursue or support a legal purpose. The honest account of lawyers is held accountable by the institutions of conversation that include law review and precedent. A religious advocate (in the age of science enabled reasoning) is concerned with an honest languaging that enables an honest experience of faith (distinct from a simple intellectual or emotional cleaving to a belief or dogma). A politician’s work is not about the TRUTH - but rather about an honest languaging that enables people to align with an honest implementation of Values toward a common purpose. 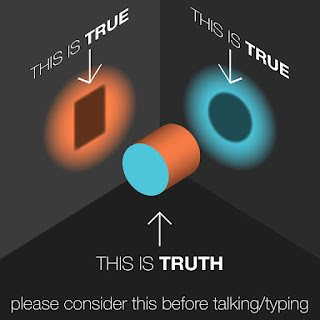 By understanding that TRUTH (as an absolute, incontestable reality) is impossible in conditions of the 21st Century - we can focus on creating conditions for an engagement of conversations about honest accounts of experience. This paradigm also enables us to grasp how vital institutions of conversation are to an open democratic society. Rather than being structured by an inadequate paradigm of formal logic that presents only the possibility or right or wrong. Conversations focused on ‘honest accounts’ present a structure of evidence and reasoning based on experience - including a more holistic inclusion of emotions, intuitions and sensibilities. Thus institutions of conversations are structured processes of aligning and enabling honest accounts - or maybe this is what we should understand as what their purpose/function should be. Inevitably such institutions would also include a social-moral licensing of action. People would be responsible to act both as morals beings and grasp the each of us exist in a socially constructed identity. As noted above in reference to Adam Smith’ s ‘Theory of Moral Sentiments’ - the moral question ubiquitous in all human behavior is measured and accounted for in the question - ‘If I do x what will people think’). As a result of the shattering of the pillars of certainty, the 20th and perhaps even more in entering the early 21st Centuries we experience a looming zeitgeist of a sort of immanent looming transformation – the wars to end all wars, the rapture, nuclear Armageddon, the digital Y2K apocalypse and the acceleration of change into the ‘Singularity’. The twentieth century began with utopia and ended with nostalgia. Optimistic belief in the future became outmoded, while nostalgia, for better or worse, never went out of fashion, remaining uncannily contemporary. The word “nostalgia” comes from two Greek roots, nostos meaning “return home” and algia “longing.” I would define it as a longing for a home that no longer exists or has never existed. Nostalgia is a sentiment of loss and displacement, but it is also a romance with one’s own fantasy. Nostalgic love can only survive in a long-distance relationship. A cinematic image of nostalgia is a double exposure, or a superimposition of two images—of home and abroad, of past and present, of dream and everyday life. The moment we try to force it into a single image, it breaks the frame or burns the surface. The word “nostalgia,” in spite of its Greek roots, did not originate in ancient Greece. “Nostalgia” is only pseudo-Greek, or nostalgically Greek. The word was coined by the ambitious Swiss student Johannes Hofer in his medical dissertation in 1688. (Hofer also suggested nosomania and philopatridomania to describe the same symptoms; luckily, these failed to enter common parlance.) Contrary to our intuition, “nostalgia” came from medicine, not from poetry or politics. It would not occur to us to demand a prescription for nostalgia. Yet in the seventeenth century, nostalgia was considered to be a curable disease, akin to a severe common cold. Swiss doctors believed that opium, leeches, and a journey to the Swiss Alps would take care of nostalgic symptoms. Among the first victims of the newly diagnosed disease were various displaced people of the seventeenth century: freedom-loving students from the Republic of Berne studying in Basel, domestic help and servants working in France and Germany, and Swiss soldiers fighting abroad. The epidemic of nostalgia was accompanied by an even more dangerous epidemic of “feigned nostalgia,” particularly among soldiers tired of serving abroad. We are living through times of deep transition. The future is continually threatened with colonization by the past - by incumbents and their legacy systems and business models. Paradoxically, the digital environment also enables a retrieval of a new form of tribalism - the more massive assemblages of network parochialisms. It also paradoxically changes the boundary conditions created by the frictions of transaction & coordination. As a consequence there is also an emergent sense of possibility of global alignment - new adjacent possibles that can shape boundary conditions for a vast sharing of value attractors. We see this in massive movements - movements that loom in their potential to mobilize citizens everywhere. Also paradoxically incumbent powers are hysterically working to enact centralized command-control of citizens (in the name of security). Modern nostalgia is paradoxical in the sense that the universality of its longing can make us more empathetic towards fellow humans, and yet the moment we try to repair that longing with a particular belonging—or the apprehension of loss with a rediscovery of identity and especially of a national community and unique and pure homeland—we often part ways with others and put an end to mutual understanding. Algia (or longing) is what we share, yet nostos (or the return home) is what divides us. The promise to rebuild the ideal home lies at the core of many powerful ideologies today, tempting us to relinquish critical thinking for emotional bonding. The danger of nostalgia is that it tends to confuse the actual home and the imaginary one. In extreme cases it can create a phantom homeland, for the sake of which one is ready to die or kill. Unreflective nostalgia can breed monsters. Yet the sentiment itself, the mourning of displacement and temporal irreversibility, is at the very core of the modern condition. While claiming a pure and clean homeland, nostalgic politics often produces a “glocal” hybrid of capitalism and religious fundamentalism, or of corporate state and Eurasian patriotism. The mix of nostalgia and politics can be explosive. The digital environment favors a trajectory of near zero marginal cost and increasing network enablement - which has been linked with an exponential increase in the value of a network. For example, Metcalf’s law - the value of a network is the number of nodes squared - n2. However, the value of a network has also be defined as a derivative of ‘group forming possibilities’ which would suggest a value of 2 to the power of the number of nodes - 2n (Reed’s Law). This suggests a real potential for new forms of value creation (also exchange, storage and accounting) including possibilities of participatory democracy - new means of engaging citizens and assembling their knowledge and creativity as and when needed in a transparent accounting of the Values involved. Despite increasing efforts to impose top-down control and ‘surveillance’, the efforts to colonize the possibilities of emerging digital environment with frames and models of the past, will be displaced. The economics of the digital environment are a change in conditions of change that favor greater forms of self-organization for efficient and effective action . The clockwork universe that promises control has been shattered as the sciences of chaos and complexity have suggested. Given the dissolution of a clockwork and predictable universe we are forced to attend more deeply to an understanding of language that enables institutions of conversation. Such institutions facilitate the ability of wayfinding through the evolving and embodied paradoxes of languaging as participants seek to understand each other. (See Harry Collins’ ‘Explicit and Tacit Knowledge’ – Collins studies how scientist actually work and share knowledge). The context of sharing knowledge and values must also include the powerful scaffolds provided by frames, metaphors and narrative in establishing structures that form how people reason. Thus not only is it an inevitable condition that nothing is black and white but also that we have to move away from finding binary be-all and end-all Values. Everything evolves and is emergent. We have no idea where we will end up. The final page – explores the power of metaphors to structure how we reason. Metaphors create an entailing logic. By listing common metaphors people use to describe ‘love’, the entailing logic of reasoning is illustrated. Another short example – even in math – the initial metaphor for numbers were ‘points on a line’ until Cantor developed another metaphor of sets (categories or buckets) with which to imagine and reason about ‘numbers’ (see Lakoff and Nunez, ‘Where Mathematics Comes From’). Even more profound is that we inevitably must ‘colonize’ the unknown with metaphors that we are familiar with. The reason being is that a metaphor is essentially a ‘cross-domain-mapping-of-knowledge’. Thus, metaphors/frames/narratives are necessary ways that enable humans to initially grasp new experiences, phenomena or realities. The challenge of the emerging digital environment involves the problem of how we can align and account for value and values. A possible suggestion lies in the capacity to harness shared meaning by means of various sorts of folksonomy of crowdsourcing of perceptions. We can see such possibilities in the many ways that various platforms use participant accounts - such as reader reviews in Amazon, likes in Facebook-Twitter-Google+ and other platforms. These sorts of simple accounts of acknowledgement, provides a sort of accounting of consensual value, value creation and accounting of how people perceive Values being enacted. The infosphere will eventually enable the accounting of almost all instances of value creation and therefore enable ways to credit and circulate new forms of value creation as currency. A currency arising in various forms of conversation of values. For example the emerging technology of the Blockchain (a massive distributed accounting ledger) holds incredible promise to disrupt the traditions of currency. However this sort of disruption faces cultural challenges that are almost mythical in nature. Modern nostalgia is a mourning for the impossibility of mythical return, for the loss of an “enchanted world” with clear borders and values. It could be a secular expression of a spiritual longing, a nostalgia for an absolute, for a home that is both physical and spiritual, for the edenic unity of time and space before entry into history. The nostalgic is looking for a spiritual addressee. Encountering silence, he looks for memorable signs, desperately misreading them. This modern nostalgia includes a yearning for ‘moral clarity’ of a binary, right and wrong - of simple concrete Values with clear opposites. Despite the 20th century’s long list of destruction of binary paradigms, the challenge of overcoming a binary worldview seems as difficult as ever. There is also another contributing nuance to a cultural clinging to this sort of nostalgic perception. We must all contend with the zeitgeist of immanence - of displacement from our own pasts – the experience of being ever more refugees from our own childhood. In the end, the only antidote for the dictatorship of nostalgia might be nostalgic dissidence. Nostalgia can be a poetic creation, an individual mechanism of survival, a countercultural practice, a poison, or a cure. It is up to us to take responsibility for our nostalgia and not let others “prefabricate” it for us. The prepackaged “usable past” may be of no use to us if we want to co-create our future. Perhaps dreams of imagined homelands cannot and should not come to life. Sometimes it is preferable (at least in the view of this nostalgic author) to leave dreams alone, let them be no more and no less than dreams, not guidelines for the future. While restorative nostalgia returns and rebuilds one’s homeland with paranoic determination, reflective nostalgia fears return with the same passion. Home, after all, is not a gated community. Paradise on earth might turn out to be another Potemkin village with no exit. The imperative of a contemporary nostalgic is to be homesick and sick of home—occasionally at the same time. Thus context of values in the 21st Century is an emerging condition of navigating paradoxes. Although we have been disciplined to think that science and logic precludes contradiction and paradox – the situation actually highlights how all apparent paradoxes call for a choice. And choice remains very messy, because there is always a proliferation of facts. Facts are innumerable – making the choice of those that matter is more difficult than we often assume. Many time observations are contested – and/or have conflicting interpretations. Ultimately every determination of a fact is an act of choice of an aesthetic perspective. Even if all aspects of an experience or experiment were fully explicable (e.g. explicit knowledge) – we can’t include all of the explicit facts available. More importantly we have no way of knowing which explicable fact may be vital for others in order for them to understand and replicate an experiment (see Harry Collins – ‘Explicit and Tacit Knowledge’). We assume that knowing the ‘facts’ is equivalent to knowing the ‘TRUTH’. … human and nonhuman interpretations, descriptions, and explanations of the world are very similar in many respects. They differ in the role of choices, difficult but possible for us, impossible for many others. Choices are key to driving scientific conversations forward. The most powerful and difficult choices cause scientific revolutions. Choices build the edifice of knowledge, beginning with a description and a question whose answer adds the next brick to the edifice. We understand the role of choice in the domain of quantum physics where observation interacts with matter. We are unable to know both the position and momentum of a particle because our modes of observation interferes with what we wish to observe. The questions we ask via experiment changes the reality that can provide an answer. After thousands of years of eternal philosophical debates – fundamental paradoxes remain unvanquished – most often we simply mathmagically make them invisible. As George Ellis has noted – mathematics progresses when we get rid of infinity (and thus become unconsciously vulnerable to sensitivity to initial conditions). 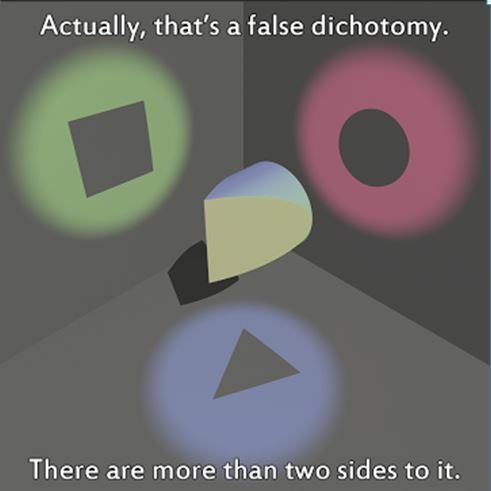 The irrevocable tension at the root of our realities is that which arises between the paradoxes – of single coins have two separate and co-creating sides (perhaps by incorporating a quantum based understanding we could include an edge as well as all three simultaneously). For any scientific conversation, indeed for any question one asks, it is necessary to choose one of these perspectives, so focus either on the whole or on some of its parts. This paradox of whole and part is as fundamental as the famed paradoxes of physics. In this way we see that paradox presents a necessity of choice and in return enables a perspective for questioning any aspect of reality. But the cost is that we must accept that the result of that our choices of queries will always be a ‘partial’ truth – a one-sided knowledge of what we query. To accept a paradoxical tension like that of part and whole as fundamental is to facilitate choice of perspectives that advance a conversation. Awareness of a paradox breeds the power to choose. This choice’s power is the power to create, to formulate powerful worldviews. Choices of perspective truly have power? Yes. Just recall where the choices of scientist have led in as little as a century: to technology – for better or for worse – that would have appeared sheer magic to our ancestors. Only by being mindful that we must choose, can we distinguish our questions from the entanglements of paradox while remaining aware that whatever choice we make, can only lead to partial truth – rather than any sort of ‘ultimate TRUTH’. By accepting the paradoxical nature of values, can we appreciate that our ‘laws of nature function as powerful sometime sophisticated metaphors. With our metaphors we can colonize the truly unknown – in ways that enable us to grasp what is familiar and eventually understand what is not. The value, and inherent values within our choice of perspectives and/or of metaphors, will always depend on the questions we ask. By accepting the deeply paradoxical reality of value and values, we are better able to be mindful of the responsibility and power of our active participation in co-creating of our world. Wagner notes that ‘Humans become truly human when absolute certainty and absolute truth dissipate’. The paradox of our freedom is that we can only embrace it through our active response-able choice and accepting that all choice results in an imperfect and partial knowledge. Thus we must embrace of uncertainty. There can be no 'self' without the immediate simultaneous arising of other. These and many more have no objective 'right or wrong' solution. In fact, they have no real solution. They do however, present us with situations where we faced an imperative - the need to Choose to choose. With any choice there are entailing structures of reasoning and consequences. The Figure here, aims to illustrate a field of paradoxes creating a possible superposition of all their related ecologies of values. The need to choose to choose, collapses the superposition into particular ecologies of tensions. To navi-gotiate (navigate-negotiate) these ecologies to establish ‘honest accounts’ of value and values, we must develop and evolve institutions of conversation. Through our conversations we can become ‘accountable’ for the choices of what we value, how we value and what values we enact. The institutions of conversation we create and collectively steward enables us to formulate the conditions of our own becoming. Today’s crisis claims we have suddenly entered a ‘Post-Truth’ era. For most reasonable people this seems self-evident. However, by scratching the surface we can see this crisis has been brewing for a long time as our traditional certainties have become ephemeral, and even the concept of identity has become an open-ended process and experience. These and many more have no objective 'right or wrong' solution. The do however present us all with a situation where we are faced with the need to Choose to choose – and the corresponding consequences and reasoning entailments. While it is impossible to 'solve' a paradox – perhaps we can outgrow certain instances of a paradox we may be confronted with. In essence, we are faced with an eternal need to wayfind through the ecology of tension that is both the context and ground that we find ourselves in. The most import paradoxes today seem to be the paradox of democracy - where a citizenry can actually elect a tyrant and the paradox of freedom - where an individual or group can freely choose to give up their freedom. In the face of the 21st Century, paradox is a deeply embodied - deeply widespread and integral civil conversation. Our conversations should proceed as means of probing, then sensing in order to inform our response-ability in a context of eternal solutioning – as our questions themselves evolve and adapt. being asked to choose between saving more life at the cost of something that makes life valuable in the first place, or preserving more of what is of value at the cost of more life. When we allow innocents to die to save more people overall, we are sacrificing some of the dignity and respect we have for human life in order to keep more humans alive. When we torture to save life, we allow more cruelty into the world in order to keep more people in it. When we choose multiple strangers over one loved one, we reject the special bonds of love so that others can have a chance to maintain theirs. That’s why I believe most such thought experiments are never satisfactorily solved. Indeed, I would suggest that the best way to use them is not to see them as puzzles to be solved at all. If we ever face such situations in real life, we will be forced to choose, and will have to do so based on the very particular circumstances of each case. The only general lesson we learn from these thought experiments is that there is sometimes a tragic conflict between life and what makes life valuable in the first place. While it is impossible to 'solve' a paradox – perhaps we can outgrow certain instantiations of a paradox. In essence, we are faced with an eternal need to wayfind through the ecology of tension that is both the context and ground that we find ourselves in. Without the claim of TRUTH to give us certainty we must depend on our institutions of conversation and faithful accountability to honest accounting of what we value and how we enact our values. The 21st Century as the age of complexity means we live in a non-linear world and our challenge is to stop reasoning linearly and engage in multiple-forms of reasoning. The fundamental paradox is that a single human is unable to think non-linearly in a productive way. However, human collective intelligence mediated by 21st century digital environment is emerging in many obvious ways. And via collective intelligence enables us to be more than the sum of us – we become a non-linear, complex, conscious system for an environment of continual innovation and change. The challenges of complexity, paradox and conflict require innovations in our institutions of conversation – ones that enable collaboration within increasing diversities of perspective, capability and aims find common purposes. For people to be civilized means building, safeguarding, evolving our institutions of conversation – it is through these institutions that people do the difficult work of establishing and teaching our accountability to shared value and values.